Preheat oven to 350°F. 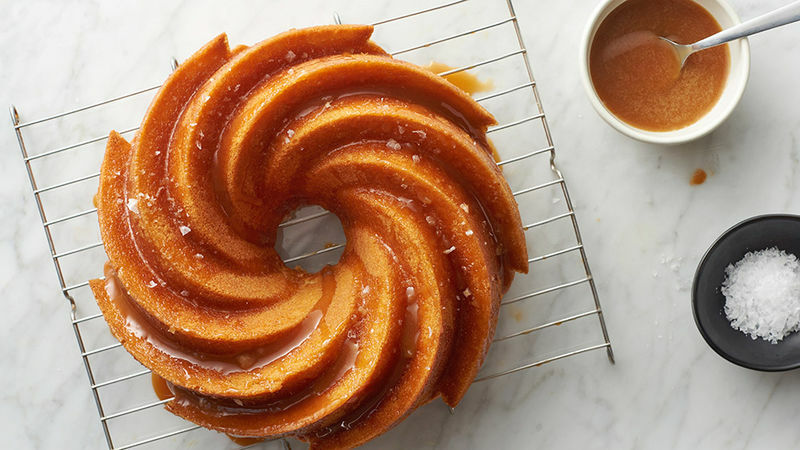 Lightly coat the inside of a fluted bundt pan with cooking spray and set aside. Place cake mix, water, vegetable oil and eggs in a large bowl. Beat batter with a hand mixer on low 30 seconds, then on medium 2 minutes. Pour batter into prepared bundt pan and bake 35-40 minutes, or until a toothpick inserted in the centre comes out clean. Allow cake to cool 10 minutes in bundt pan before inverting onto a parchment paper-lined cooling rack to cool completely, about 1 hour. Meanwhile, make the caramel sauce: Pour sugar, lemon juice and water in a medium saucepan and place over medium-high heat. Heat until bubbles form and the mixture is simmering. DO NOT STIR. Occasionally lift the saucepan and swirl the mixture, very gently, while the sugar is heating. In about 10 minutes, the sugar will start to caramelize. Resist the urge to stir. Let the mixture simmer until it reaches a rich, dark amber color and remove from heat. Pour in butter and heavy cream (it will bubble up quite a bit). Whisk to combine and set aside to cool for 10 minutes. Spoon cooled caramel sauce over cake, then sprinkle with sea salt. Serve immediately.